Beginning in the 2018-2019 school year, Westmont Elementary School, which houses our Visual and Performing Arts (VAPA) Academy, will be modernized. The Westmont students and staff will move to the Sun View Elementary School campus. Sun View will serve as our interim/temporary campus during each schools’ modernization project. Construction at Westmont will be completed in time to welcome everyone back for fall 2019.Next will be College View Elementary School in the 2019-2020 school year. During construction, College View students and staff will safely attend school at Sun View. Our District team has prepared a tentative timeline for modernization at our remaining campuses. This amended approach maximizes Measure R cash flow and expedites physical improvements at more schools, such as fencing and field projects. Our Board of Trustees voted to support an expedited fencing plan. It is anticipated that safety fencing will be installed at all of Ocean View’s campuses by the end of the 2020-2021 school year, using an attractive tubular steel panel system at a height of eight feet, and supplemented by interior fencing, using two-inch chain link fencing at a height of six feet. Perimeter fencing for our campuses located adjacent to “pocket” parks will also use a tubular steel panel system at a height of eight feet to enclose the school grounds. How are Ocean View School District schools doing? Since 1874, the Ocean View School District has been providing students in Huntington Beach and portions of Fountain Valley, Westminster, and Midway City with an excellent education. 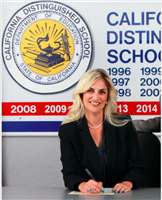 OVSD has multiple National Blue Ribbon and Distinguished Schools in the district. Three of our schools have received the prestigious Golden Bell Award from the California School Boards Association and we are home to one NASA Explorer School. Good schools improve the quality of life in our community and protect the value of our homes. What is Measure R? Why did the Board of Trustees vote to place it on the ballot? Most Ocean View School District schools were built more than 50 years ago and need to be upgraded. Measure R will make repairs and improvements so that our schools can serve our students and community well for the decades to come. Local schools also need updates to continue providing students with a 21st-century education, a solid background in science and math, and the skills they need to use today’s technologies and ensure their success in high school, college, and careers. The OVSD Board of Trustees placed Measure R on the November 2016 ballot to address these needs and improve local school facilities for the future. Specifically, what would Measure R do? How do we know Measure R funds would be used responsibly? How much would Measure R cost? Measure R will generate up to $169 million for school improvements. The cost of this measure would be limited to $30 per $100,000 or about $109 per year for the typical homeowner for as long as bonds are outstanding, in accordance with state law. This cost is based on assessed value (not market value). The entire cost is deductible on state and federal income taxes. Can the State adequately fund upgrades to our schools? No. The State is not currently funding school facility improvements. Until 2014, school districts could count on the State for approximately 40% of school improvement costs. However, today this burden has been passed on to local communities. This is why the Board of Trustees voted to place Measure R on the November 2016 ballot. 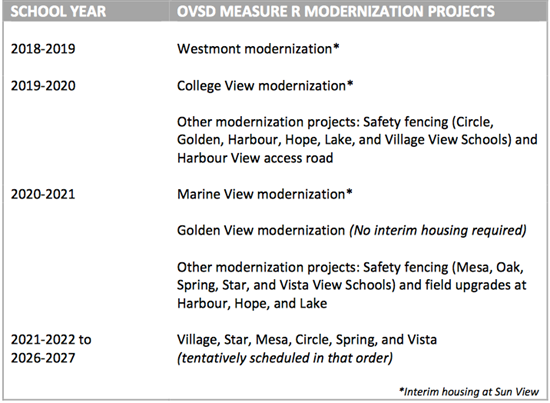 Is there a comprehensive list of the projects that could be funded by Measure R? Yes. A detailed Facilities Master Plan and a full list of projects can be found online at www.ovsd-fmp.org. Would Measure R help our district qualify for state matching funds? Yes. Measure R will allow our school district to access these state dollars should they become available. Without passage of Measure R, state matching funds will go to other districts. Is there any other way to repair, update, and improve our schools? Like all public school districts, OVSD has very few options when it comes to funding the necessary renovations and upgrades to our local schools. Our schools can’t rely on the State to complete these repairs. Measure R will provide locally-controlled funds to complete prioritized projects and provide a safe and modern learning environment for our students. When will Measure R appear on the ballot? Measure R was on the November 8, 2016 ballot and passed by 58.9%. All registered voters in OVSD were be eligible to vote on the measure. How many votes did Measure R need to pass? In order to pass, Measure R needed to be supported by 55% of those who vote on it, that occurred on November 8, 2016. How can I find out more information about voting or registering to vote? You can register to vote by visiting www.RegisterToVote.ca.gov or by calling the Orange County Registrar of Voters at (714) 567-7600. Visit www.OCVote.com for more information about voting.